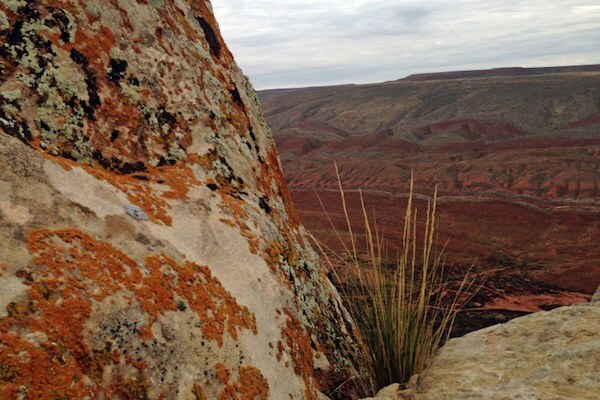 It felt like a sucker punch to the gut last week when the state of Utah sold off 800 acres of land in southern Utah to the highest bidders, the hardest blow being the loss of a 380-acre chunk of Comb Ridge near Bluff. On Oct. 18, and for decades before that, it had been public land, a place where locals and visitors could roam freely. Now it isn’t, and it likely never will be again. The Comb Ridge parcel lies just north of Highway 163, stretching from the sandstone ridge’s crest east toward Butler Wash. The Hole-in-the-Rock trail, forged by Mormon pioneers in 1879, passed through the parcel, as does an old, abandoned blacktop highway, imbuing it with an end-of-the-world feel. Crest of Comb Ridge on the parcel that was sold. It's one of the easiest places to access Comb Ridge from the highway, so it gets a lot of use — people camp, hike and just climb up to the ridge to sit quietly and take in the contorted and spectacular landscape all around. It lies within the proposed Bears Ears National Monument, and probably would have been swapped out for federal land elsewhere under a monument declaration. Now it will be a private inholding. After the Hole-in-the-Rock Foundation nominated the parcel for sale this summer, local conservationists tried in vain to stop the auction, and scrambled to raise enough money to buy the parcel themselves. But with a bid of $500,000, Lyman Family Farm Inc. beat both them and the Hole-in-the-Rock Foundation to it. Lyman Family Farm, however, appears to be more property speculation than agricultural operation. In 2015, the company, registered by Joseph L. Hunt, bought three parcels of state land near Bryce Canyon National Park for a total of $292,000. At the recent auction, in addition to the Comb Ridge acreage, it also bought a parcel about 20 miles east of Canyonlands National Park, and one — at a price of $1.74 million — near Zion National Park. Hunt has been evasive about his plans for any of the parcels. Hunt is the president of Air Resources Medical Group, which is headquartered in South Jordan, Utah. He is originally from Blanding, a Sagebrush Rebellion command post and home of Phil Lyman, the San Juan County commissioner best known for leading an ATV protest ride down a closed road in Recapture Canyon in May 2014. The state land sale unveils a paradox within Lyman’s movement. These Sagebrush Rebels are motived mostly by a desire for more local control over, and access to, the vast tracts of federal land in their backyards. The best way to accomplish this, they argue, is to transfer the federal land to the states. The 15,000 residents of San Juan County will, in theory, have far more sway over state bureaucrats and politicians than they do over those in Washington, D.C.
By prioritizing revenue generation above all else, the state takes control over the land away from the people, and puts it into the hands of corporations. By selling that land outright, it tosses any remaining shred of local control right out the window. One of San Juan County residents’ biggest fears regarding a possible Bears Ears National Monument is that it would take away local control and access to the lands that they’ve long roamed freely. The fear is understandable, if somewhat irrational: If the monument is designated as proposed, most traditional uses could continue. The same, however, cannot be said for the parcels sold off by the state, including the one on Comb Ridge. It’s likely only a matter of time before the “No Trespassing” signs and fences go up, and Hunt proceeds to do with the land pretty much whatever he likes. And, believe me, he’s not going to ask our opinion about it, whether we’re locals or not. Jonathan Thompson is a contributor to Writers on the Range, the opinion service of High Country News, where he is a contributing editor.